A former National Security Adviser (NSA), Sambo Dasuki, on Tuesday wrote the court informing it of his resolve to avoid court hearing until the prosecution obeys the court’s ruling on his bail. Mr Dasuki is facing trial at an Abuja Division of the Federal High Court for alleged illegal possession of firearms among other charges. 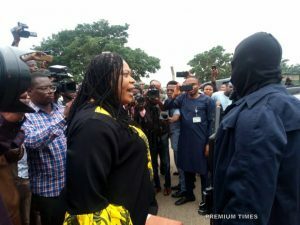 The former NSA, who is facing separate trials for alleged abuse of office while he was NSA, has repeatedly been granted bail by various courts which were not obeyed by the Nigerian government despite him meeting the bail conditions. In a response, the prosecution counsel, Dipo Okpeseyi asked the court to order the continuation of Mr Dasuki’s trial in absentia. Mr Okpeseyi argued that the cases for which Mr Dasuki has been denied bail are independent of the instant case and described the defendant’s action as an affront to the court. “This is not the first time. He did it in January and in April,” Mr Okpeseyi said. In a short ruling, Mr Mohammed said the court will not grant the request by the prosecution to proceed with Mr Dasuki’s trial in absentia, unless the prosecution depose to an affidavit accusing the defence of wilfully avoiding the court. According to the judge, the court had in its previous decision on April 10 settled the issue of Mr Dasuki’s alleged refusal to attend court hearing. “Let me observe that this court has in its ruling of April, 10, 2018 noted that any day that the defendant is absence in court and the prosecution believes that the defendant is unwilling to attend trial, the prosecution should swear an affidavit to show that the defendant has wilfully refused to come to court,” Mr Mohammed ruled. The judge further said the decision requested by the prosecution can only follow the applicant’s compliance with the ruling of the court on April 10. Mr Ahmed also refused to treat the request made by Mr Dasuki in his letter and ordered the defence to properly communicate the court, for the letter to be included in its record. Mr Ahmed said the court is a court of record which does not accept direct communication from parties. The court adjourned the matter to November 19 for the prosecution to comply with the orders of the court on April 10, for a proper application for Mr Dasuki’s trial in absentia.